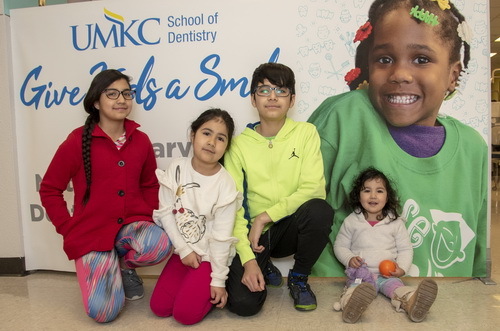 Maria Flores brought her oldest child to the UMKC School of Dentistry for his first checkup a dozen years ago. The care was good and affordable, so as her family grew she returned regularly. It’s easy to see why Flores, who brought her children in on Feb. 5, keeps coming back. The school’s Lowry Pediatric Clinic offers comprehensive care – from cleanings and checkups to fillings and other needed restorative work – in a bright, kid-friendly space. If families have trouble affording the care, free or reduced-rate work is available. The school estimates that the donated care through this clinic is worth approximately $60,000 a year. And in the first full week of February, visits to the Lowry Pediatric Clinic get a little extra boost. February is the American Dental Association’s Children’s Dental Health Month, along with the association’s Give Kids a Smile program. UMKC has participated in the program for 14 years, and this year that meant extra toys, story books and coloring exercises for the children. The goodies all are in line with the program’s goal of promoting the benefits of good oral health to children and to their caregivers and teachers. Find photos from the pediatric clinic and events here.